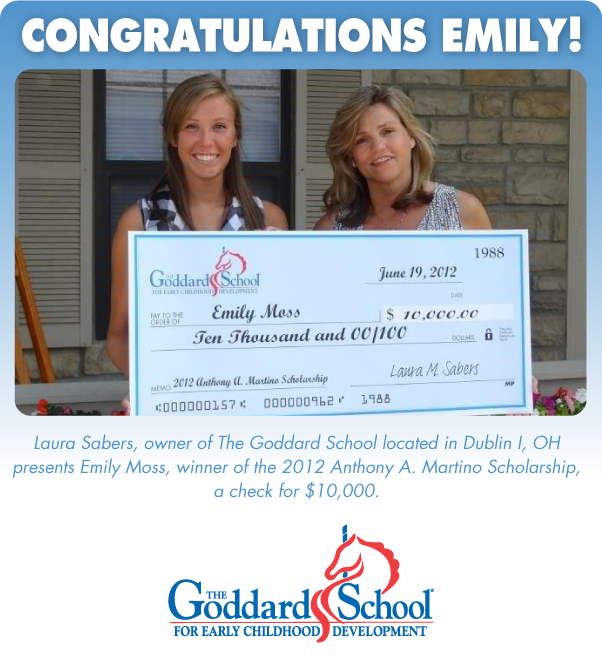 Goddard Systems, Inc., franchisor of The Goddard School®, has named Emily Moss of Dublin, OH, the 2012 recipient of the fifth annual Anthony A. Martino Memorial Scholarship (AAMMS). The $10,000 scholarship is awarded annually to a junior or senior in high school who graduated from The Goddard School. This year’s other finalists included Haley Carley of Dublin, OH and Kristyn Tremblay of Mahwah, NJ. The AAMMS is named in memory of the founder of The Goddard School franchise system, an entrepreneur who started several other well-known franchise companies including AAMCO Transmissions, Inc. and MAACO Auto Painting and Bodyworks, Inc. Mr. Martino worked his way up from humble beginnings to achieve great things for himself and his family. This year, for the very first time, the public was invited to help select the scholarship recipient. Videos of the top three finalists were posted on The Goddard School Facebook page and fans voted for their top choice. The AAMMS winner will receive $10,000 to use toward their education at an accredited college or university. The two runners up will each receive a $250 Goddard School American Express Gift Card to use towards books and school supplies. Winner Emily Moss attended The Goddard School located at 6239 Perimeter Drive in Dublin, OH and graduated from the school’s Pre-Kindergarten program in 1999. Moss, also a graduate of Dublin Jerome High School with an outstanding academic background, has been deeply involved in a variety of extra-curricular sports, clubs and volunteer activities. Moss will be attending Ohio State University in the fall and plans to study in the school’s honors program for neuroscience. Finalist Harley Carley attended The Goddard School located at 6239 Perimeter Drive in Dublin, OH and graduated from the school’s Pre-Kindergarten program in 2000. Carley, a graduate of Dublin Coffman High School, has volunteered more than 100 hours at her area Ronald McDonald House. She was involved in a variety of extra-curricular activities and was named valedictorian of her class. Carley will be attending Emory University in the fall and plans to study anthropology and human biology. Finalist Kristyn Tremblay attended The Goddard School located at 150 Hilltop Road in Ramsey, NJ and graduated from the school’s Pre-Kindergarten program in 1998. Tremblay, a graduate of Mahwah High School, has a superior academic background and has also been deeply involved in a variety of high school sports including soccer, basketball and lacrosse. Tremblay will be attending Towson University in the fall and plans to study marketing and fashion merchandising. To view the video of the finalists, please visit: http://www.youtube.com/watch?v=zuSNYVi0K1w. For more information on the Anthony A. Martino Memorial Scholarship, please visit www.goddardschool.com/Scholarships.